Our funeral home is situated on Bury New Road (A56), the main road connecting Manchester and Bury, in the area of Whitefield. 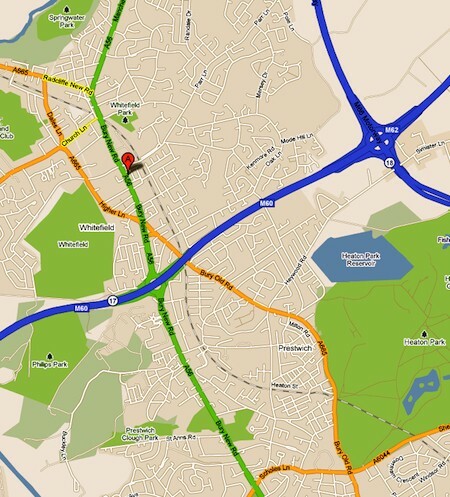 Our location is approximately equidistant from Manchester city centre and Bury town centre. We are ideally located for those wishing to travel by public transport, with the Whitefield Metrolink station opposite being only 50 yards north of the funeral home. Take the A56 North (Great Ducie Street) towards Bury, travelling through Higher Broughton, Sedgley Park and Prestwich. Cross the M60 at Junction 17, continuing to follow signs for A56 (N) Bury, into Whitefield. The funeral home is located on the left hand side, just past Hamilton Park, Hamilton Road, before the intersection with Church Lane and Stanley Road. Parking is available in Hamilton Road and to the rear of the premises for wheelchair access. Take the A56 South (Manchester Road) towards Whitefield and Manchester, travelling through Blackford Bridge and into Whitefield. Passing the Morrisons supermarket and the Metrolink station on the left hand side, and the funeral home is on the right hand side before Hamilton Park. If you a travelling to the funeral home via the motorway network, use the M60 (Manchester Ring Road) and exit at Junction 17, signposted for A56 and Whitefield, Prestwich and Manchester City Centre. If approaching from the east (M62 Leeds, M66 Burnley, M60 Ashton-under-Lyne), take the 3rd exit on the roundabout. If approaching from the west (M62 Liverpool, M61 Bolton, M60 Salford), take the 1st exit on the roundabout. Follow the A56 North (Bury New Road) towards Bury and Whitefield. The funeral home is located on the left hand side, past Slattery's and just after Hamilton Park/Hamilton Road, before the intersection with Church Lane and Stanley Road (Morrison's supermarket).